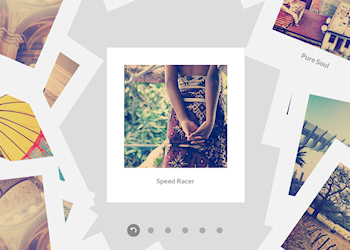 A flat-style Polaroid gallery where the items are scattered randomly in a container. When an image is selected, it will move to the middle while the other Polaroids will make space for it by moving to the sides. An image can have a backface which will be shown by flipping the Polaroid when clicking on the current navigation dot again.